CAMARILLO, California, May 3, 2013 (ENS) – A Red Flag Warning for high fire danger remains in effect for much of Southern California due to high temperatures, low humidity and gusty winds. Across the state, more than 3,000 firefighters are battling six major wildfires Friday, California fire officials said. Some 990 of those firefighters are battling the giant Springs Fire that broke out Thursday in the Camarillo area, about 50 miles east of Los Angeles. The 15-square-mile blaze threatened as many as 4,000 homes and 300 commercial properties as it burned toward the beach Thursday. Fifteen homes and five commercial properties were damaged, and no injuries have been reported. The fire continued to burn very actively overnight fanned by gusty northeast winds in an area 20 miles west of Malibu, burning mostly in rugged mountains. The Santa Ana winds, which drove the fire Thursday from Camarillo Springs to the Pacific Coast Highway, were expected to die down in the midafternoon, Ventura County fire officials said at an early morning briefing today. But those winds will be replaced by onshore winds that could turn the fire back to areas it has already charred. Highway 1, the Pacific Coast Highway, is closed from Las Posas Road to the Ventura-Los Angeles County line. Local law enforcement officials ordered the evacuation of homes in Deer Creek and Yerba Buena as the fire continues to burn in the Sycamore Canyon area of Point Mugu State Park. Mandatory evacations are in effect for approximately 100 residents, while voluntary evacuations are in effect for some 500 residents. Earlier, the fire jumped the Pacific Coast Highway at Point Mugu and burned on a beach shooting range of the U.S. Naval Base Ventura County. The base ordered an evacuation of a nearby housing area and urged personnel in other Point Mugu housing to evacuate voluntarily. Six air tankers and eight helicopters were used this morning to drop retardants on the flames, but the fire is moving into state parklands on the coast and fire officials said retardants cannot be dropped on parkland. To date, the blaze is just 20 percent contained, fire officials said. 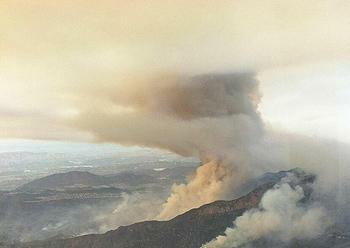 The Springs Fire underlines predictions that California faces a difficult summer fire season. After a record dry January and February in much of the state, water content in California’s snowpack is only 17 percent of normal, which means a below average water supply this summer, the California Department of Water Resources reported Thursday.